Work from Jessica Rath. Left: Deacon Jones, 2010. High-fire glazed porcelain, 6 x 5 1/2 x 5 1/2 inches (cropped); Right: Sisters normal, 2011. Archival pigment print, 36 x 48 inches (cropped). Pandas, elephants and apples? Turns out that animals aren't the only things in nature on the endangered list. 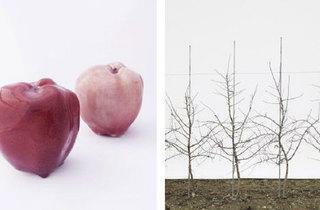 Artist Jessica Rath explores 100-year-old varieties of apples on the verge of extinction in her exhibit Take Me to the Apple Breeder. 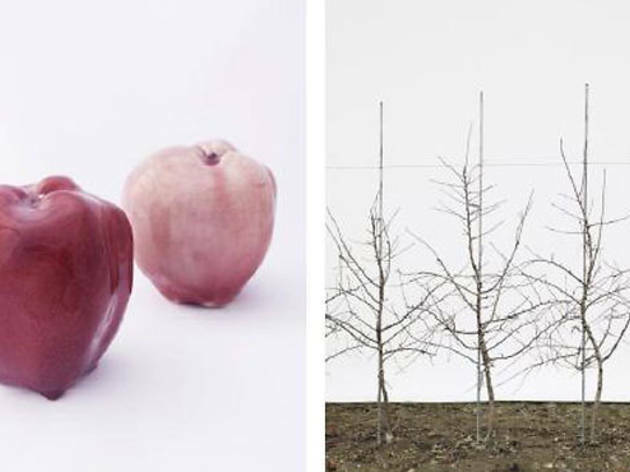 The show includes porcelain apple structures and large-scale photographs of hybrid trees and is based on her visits to the USDA/Cornell University Plant Genetics Resource Unit in Geneva, NY. The site is dedicated to helping the apples avoid extinction as well as cloning them to create new varieties at the Agricultural Experiment Station for mass consumption. More than a comment on politics or society's role in the environment, Rath's work documents nature's ability to survive on all fronts and expresses the beauty inherent in biodiversity.